Few biographies of Bolivar so much as mention Demarquet and the works that do do so very much in passing. Yet a wealth of correspondence and other details confirms his ongoing and increasingly close relationship with the Liberator and his part in a number of key episodes in the struggle for Latin American independence. The fact that he played this role so close to the great man himself, virtually in his shadow, may explain why he is less known than others who, for instance, led troops into famous battles. Though he was every inch a military man – with (per Von Hagen) the missing fingers to prove it -, often his diplomatic and even what we would call today his interpersonal skills were of as much use to the cause as his skill and courage in battle. The most common, if brief, mention of Demarquet is as one of those who took part in the Expedition of Los Cayos. This would have been almost immediately after the two men met. The invasion the Liberator Simón Bolívar planned from Haiti at the end of 1815 in order to free Venezuela from Spanish forces is known by the name of the expedition of Los Cayos de San Luis or just Los Cayos. Bolivar arrived from Jamaica on Los Cayos de San Luis, on the island of Haiti, on December 24, 1815; later moved to Port-au-Prince, where he had an interview on 2 January 1816 with President Alejandro Petion, who undertook to provide the funds necessary to carry out the enterprise. Subsequently, after being granted supreme power by an assembly of the main refugee leaders from Venezuela and New Granada, Bolívar began to refine the details of the expedition against the strong Venezuelan coast, with the help of the Haitian military governor of the Cayos, General Ignacio Marion. As for the resources which finally resulted from Petion's efforts, these consisted of 6,000 rifles, ammunition, food, a complete printshop, the freight of some schooners and a large sum of money. With all this Bolivar organized a small fleet of 7 schooners: Bolivar, General Marino, General Piar, Constitution, Brion, Felix and Conejo, accompanied by another of his friends in Haiti, Robert Sutherland, La Fortune. Finally, the expedition sailed on March 31, 1816, including in it Manuel Piar, Santiago Mariño, Gregor MacGregor, Francisco Antonio Zea, Pedro Maria Freites, Bartolomé Salom, Pedro Leon Torres, Carlos Soublette, Pedro Briceno Mendez, Manuel Valdes Diego Ibarra, Juan Bautista Bideau, Charles Chamberlain, John Baillie, Carlos Eloy Demarquet, Renato Beluche Henry Ducoudray-Holstein and others. 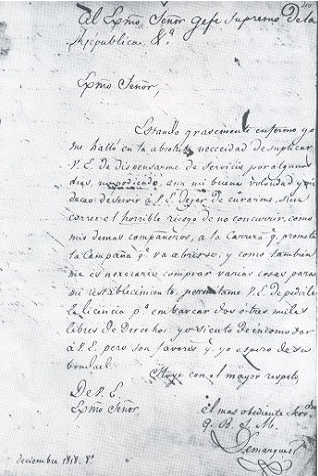 ...despite the setbacks suffered by the expedition and the Liberator himself in Ocumare, the historic significance of the Expedition of los Cayos is that it allowed Santiago Mariño, Manuel Piar and then José Francisco Bermudez to undertake the liberation of east of the country and that MacGregor with Soublette and other leaders definitely were established on the mainland, to make way for the final triumph of the Republic. Around this time, too, Demarquet is noted as one of the visitors to Robert Sutherland, a British merchant (and possibly a secret agent) who was one of Bolivar's early supporters and ultimately was given Venezuelan nationality Moises Enrique Rodriguez, Freedom's Mercenaries, Hamilton Books, 2006 I:93. By express order of His Excellency the General I have the honor to transcribe to Y. S. to be brought to the knowledge of H. E. the Liberator, President of the Republic. Later writers, like Bolivar himself, have shown a low opinion of Ducoudray who, unfortunately, left one of the most cited, if slanted, memoirs of the Liberator. Vila compares him unfavorably to Demarquet, speaking of “a French official of talents much superior to those of Ducoudray-Holstein, colonel Carlos Eloy Demarquet.” Manuel Pérez Vila, Los libros en la Colonia y en la Independencia‎, 1970, 80 (This curious work literally traces the literary influences on various actors in these events).